Coriander , cumin flavored burger patties , on toasted bun , with mayo-ketchup base , layered with tomato (no greens please ) pan fried turkey bacon , and topped with pickled onion( a modern name for our good old kerala style challas/sallas)..Wanna Come over for a "grill party"??? Hows your weekends coming along? For us , Friday evening till Saturday midnight is like an elongated day , with a lil patch of night here and there. Less sleep , awesome food, more fun with friends and family. Last Saturday after the lil party at aunt's place with awesome straight from the grill food , nobody could even move , still we manage to sneak out for a " second show mallu movie", a totally hilarious one...Oh yeah we have a malayalam theatre nearby and never miss any new ones, something I never used to do back in India..
Total Time - 30 minutes.+ an hour for preparation. Ground Black pepper - 1/4 to 1/2 tea spoon or as you like it. In a large bowl , mix ground meat with all the other ingredients . Divide into 8-10 orange sized balls balls and form patties (wet your hands with a lil water or oil , take an orange sized ball and press it lightly on your palm with the other hand.Shape the sides and arrange it on a tray) Refrigerate till you are ready to grill;at least for an hour. You can make it any size you want. Heat the grill to medium , lightly brush it with olive oil or any oil , place the patties on the grill , and cook each side for 10 -12 minutes plus , turning them a few times and lightly brushing it with the glaze. 10-12 minutes on each side is for well done, and since i hate to see any pink inside i cook for this much time and you can adjust the cooking time as you want. In the last 2 minutes , put a piece of cheese slice on top of the patty and let it melt. Mean while arrange everything to layer the burger. If you don't have a grill ( I normally use george foreman indoor grill) , do this in a cast iron pan on stove top. American cheese or any cheese. Lightly toast the burger buns ( pan or grill). Spread a spoon of mayo - ketchup on the base. 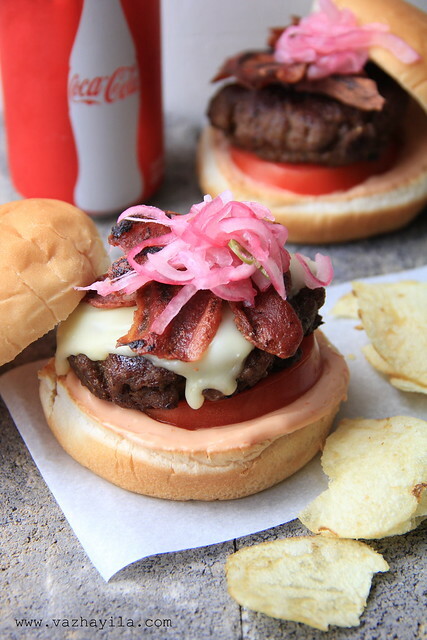 Place a piece of sliced tomato , then the burger patties with melted cheese , , then broken turkey bacon pieces and top with pickled onion. Here You go !!! Have a Bite , Njoy!!! In a small bowl , mix red onions , salt and lemon juice . Squeeze it with your hands as you mix it to release maximum juice to the bowl. Mix well. Add chopped green chiles. keep in the refrigerator and serve chilled. wow..Thats an yum yum beef burger recipe! !nice with sallas..indeed a G8 combo! Delicious. Liked the colour of pickled onion. First time here. Glad to follow you. Hope you will visit me too. Can have this any time,looks super delicious,love the pickled onions..
Ha ha reading sallas brought a huge nostalgic smile, al most every sunday we had them with or without cutlets. The burgers look so so good. Nice blog posting. It's really helpful for me. Thanks. Delicious and wonderful !! loved the color of pickled onion !! These look great. I love homemade burgers - they taste so much better. Thanks for the recipe! 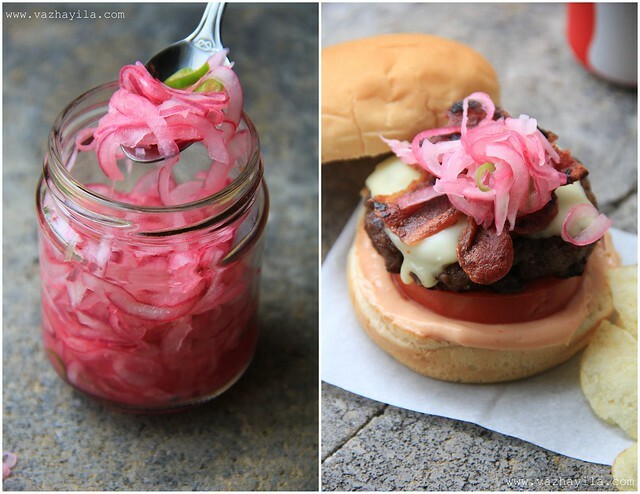 Nothing will beat homemade burgers, both burger and pickled onions looks fantastic..
sarah..this is sooo gorgeous,,! 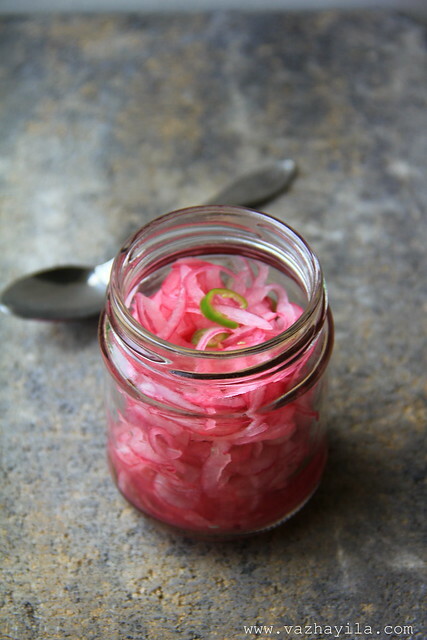 loved ur arrangement n the pics are as usual mindblowing..to top a recipe of pickled onions yayy! bookmarked ! 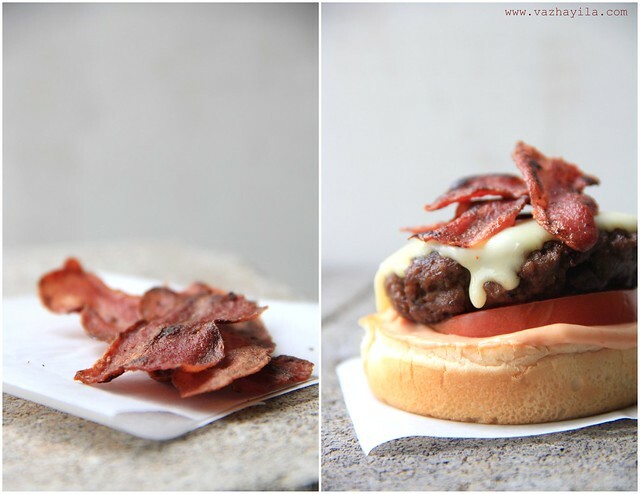 Wow..I am craving some burger now..looks so yum and the pictures are mind-blowing..
i love the clicks! awesome! this is totally yumm! Its been a long time since I made some burgers! and this is so tempting! Sure...count me in Sarah! Don't wanna miss an opportunity to taste your delicious homemade goodies ;) Super aayittundu...those pinkish onions are such a beauty. so tempting..I love burgers anytime...nice pics also. i'll definitely include this on recipe card file. Loved the recipe. One query - do you use the juice of the onions for the pickled onion or you discard it? @ Jerin..Good to hear u loved the recipe.. I use the juice. Thats why i said in the recipe to squeeze it to the bowl and mix well.so that the onions will be in a sort of brine with that liquid. Squeezing helps it to get the color and the onions will be so flavorful.. In the first picture if you look to the bottom of the jar , you can see the liquid :)..
@ Plateful...You are always welcome here kto!!! Beautiful clicks honey....kandittu muzhuvan thinnu theerkan thonunnu, appo sheri burger ingottu parcel porattettoo..:)pickled onion look divine and great color dear..
Lovely burger, I particularly liked the pickled red onion, I'm going to try that. 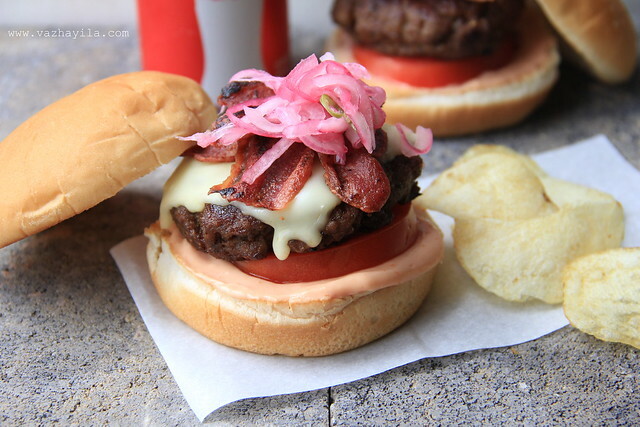 Simply irresistible burger with pickled onions.Love it. Excellent burger combo ! And that red onion pickle is like a classic touch! a quick question i have .. for how many days can you keep those pickled onions ? Gorgeous, yummilicious and mouth watering burger. I liked the colour of onion. What an absolutely lovely blog--I loved your recipes, and the pictures are to die for! I want to reach out and grab that jar of pickled onions right now! Loved the contrast of the pink onions with the gray background. It looks simply irresistible.. go for a perfect snacks item..
halloooooooooooooo...Enthokeyundu visheshangal..oru padu naalayi ee vazhiku vanittu.Summer adichu polikukayanlle..Pickled onion nu kettittu thane vayil vellam vannu..kandappol sahikunilla..
Ente sarah..Ee pics kandittu kothi aayittu vayya..Enikku challas kandittannu sahikkan pattathe..Adipoli! great pics! going to try the spice combination in burger soon. Nice one Sarah.. loved the background and color combos..
Im drooling looking at these clicks!!!! Got to try the pickled onions soon!!! I am so much new to cooking and the recipes in here are very much inspiring...gotta try them all out soon!! Adding your own personal touch with any dish, may it be a burger or a sandwich - adds a certain appeal to those who will enjoy the food that you have prepared. For those who want to make an ordinary meal into something special, making your own sauce or flavor will do the trick! Thank you for sharing!